While South Korea’s stock market took a strong rebounding leap last week amid signals of trade war alleviation between the United States and China, analysts remained in a cautious note ahead of the midterm elections in the United States slated for Tuesday, fueled by concerns that news favorable to stock rallies might have come in disguise. Analysts issued warnings over the weekend on possible post-election volatility in the domestic stock market, saying optimism in the global financial market would be pivotal in a Republican victory in the upcoming election. The turning point was US President Donald Trump’s remark on Twitter on Thursday that hinted at a possible summit with his Chinese counterpart Xi Jinping. He also reportedly asked his cabinet to begin drafting potential terms for a deal with Beijing. The move, instantly perceived as a breather in prolonged trade tension between the world’s two largest economies, led to a quantum leap of the domestic stock market. 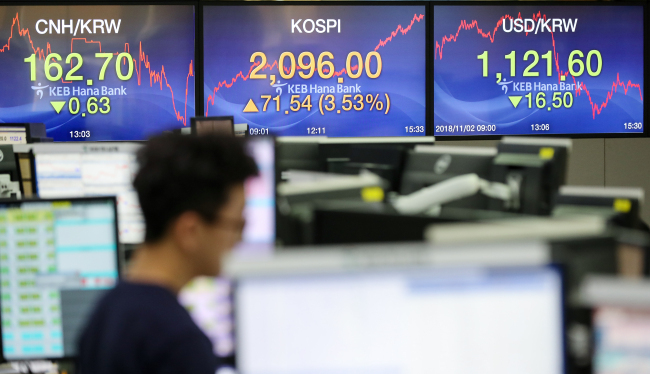 On Friday, Korea’s benchmark index Kospi jumped 3.5 percent, the biggest gain since December 2011, while the second-tier Kosdaq soared 5.1 percent, the largest since August 2015, buoyed by strong foreign net purchases. Foreign investors net purchased shares worth 440.8 billion won ($394.3 million) on the Kospi and stocks worth 126 billion won on the Kosdaq. This comes in contrast to net sales of stocks worth 1.6 trillion won on Kospi for five trading days until Oct. 29, which contributed to Kospi’s lowest mark in 22 months. Its 0.9 percent rebound Tuesday relied on institutional net purchases of shares worth 519.9 billion won. The drastic turnaround came as a surprise to Ha In-hwan, an analyst at SK Securities. Ha added that investors should brace for heightening market volatility after the election, saying the two indexes are open to possibilities of moving either up or down by a huge margin. 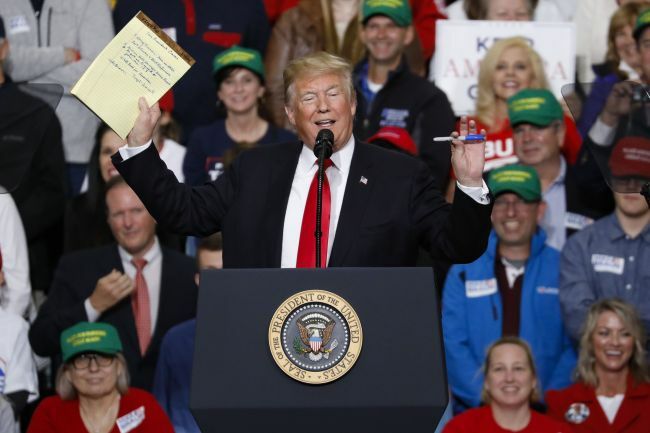 Park Hee-chan, an analyst at Mirae Asset Daewoo, wrote in a note Friday that Trump’s recent remarks surrounding a potential deal with China appeared intentional. Park added the midterm election result itself would have a neutral impact on the Korean market, while urging investors to keep an eye on US Federal Open Market Committee‘s stance over emerging signs of retreat in US economy, in a meeting slated on Wednesday and Thursday.